The Dubrovnik Airport is approximately 24 km from the Valamar Lacroma Dubrovnik Hotel. 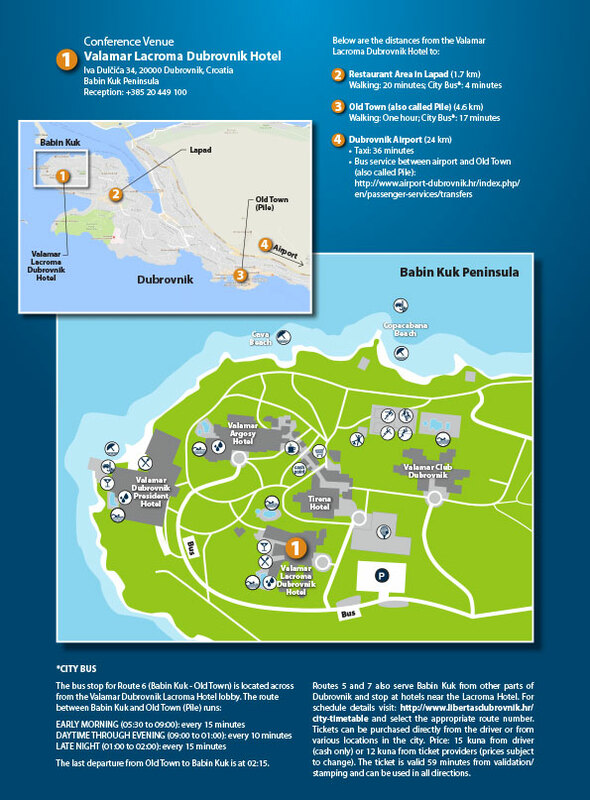 Travel by city bus between the conference venue (on the Babin Kuk Peninsula) and the old city (Pile) is easy. The last departure from Old Town to Babin Kuk is at 02:15. Routes 5 and 7 also serve Babin Kuk from other parts of Dubrovnik and stop at hotels near the Lacroma Hotel. For schedule details visit: http://www.libertasdubrovnik.hr/city-timetable and select the appropriate route number. Tickets can be purchased directly from the driver or from various locations in the city. Price: 15 kuna from driver (cash only) or 12 kuna from ticket providers (prices subject to change). The ticket is valid 59 minutes from validation/stamping and can be used in all directions. Oryx Rent-A-Car is offering a 30% discount for conference attendees. When making a reservation, enter “Ocean Optics Conference” in the notes section and the discount will be applied.